Before the Obama administration left office, California education officials had one final request: give us a pass from federal testing laws so we can begin giving students a new statewide science exam. Last week, a top Obama administration official at the U.S. Department of Education formally rejected that request, ruling that California Department of Education leaders will be breaking federal law if they move forward with their current plans to administer the new tests this spring — plans state officials still have no intentions of changing. But it will be up to the Trump administration to determine whether California should face consequences for ignoring the ruling — such as potentially losing its federal schools funding — setting up a scenario that could reveal much about the next Secretary of Education's approach. Some background: California is in its first full year using the new Next Generation Science Standards, and state officials want to administer a new, online exam that matches those standards. But the state's transition plan calls for students to take a shortened, pilot version of the new test this spring, and in 2017-18, to take a "field test" of the new assessment. Federal officials are concerned that plans leaves the state without meaningful science test score data until 2018-19. 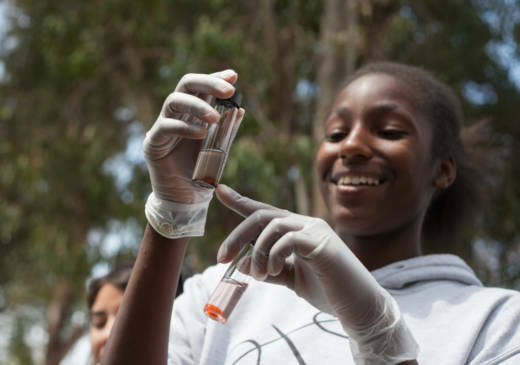 In a Jan. 18 letter to the California Department of Education, an Obama administration official wrote the state "will not be able to determine whether student achievement in science is improving … or be able to maintain or enhance the level of transparency in reporting to parents and the public on student achievement in science" for the next two years. The Obama official's ruling means California would have to give students its old science tests in order to comply with federal laws. But state officials and the California Science Teachers Association have pointed out the old exams are based on an old standards, written in 1998, that no longer guide what California schools teach in science class. "We were disappointed — but not surprised — by the denial of our waiver request," wrote Peter Tira, a spokesman for the California Department of Education, in a statement. "We will continue to move forward," his statement continued, "in the best interests of the students of California, which includes piloting our online, computer-based science assessment in the spring based on Next Generation Science Standards. We have no intention of administering the old, paper-and-pencil science tests based on outdated science standards adopted in 1998." This isn't the first standoff between California and the feds over a standardized test. In 2014, when the state wanted students to take only portions of a new math and reading test, U.S. Department of Education officials threatened to withhold as much as $3 billion in federal funding. Federal officials ultimately backed down and state officials moved ahead with their own plans. The Jan. 18 letter to the state includes no explicit threat to cut funding over the science exams. The Obama administration official writing it — Ann Whalen, a senior advisor to then-Secretary of Education John King — noted state officials offered to "report raw scores" from next year's statewide field test, but since "these offers … are not formally before me as part of CDE's waiver request," she could not formally rule on them. Whalen's letter does note federal officials would be "willing to review any new waiver request from a state." That request would likely land on the desk of a Trump administration official. Whalen's letter noted she was acting in the capacity of the Assistant Secretary for Elementary and Secondary Education, a position for which President Donald Trump has not named a nominee, according to The Washington Post and Partnership for Public Service. Tira, in his statement, wrote California Department of Education officials "are going to review and explore all of our options at this point, which include working with the new administration on this issue."